This lovely old farmhouse was completely re-built, combining the best of the old with the unashamedly new, in terms of bathrooms, pool, central heating etc. Situated at a height of 350 metres, the setting is stunning with spectacular views on every side. To the east, the sun rises over the hill town of Penna San Giovanni, to the south lies Monte San Martino at 603 metres, while you can watch the sun set over the Sibillini Mountains at over 2,400 metres. Floors throughout the house are beautifully tiled in dusky local terracotta and all the ceilings have exposed beams. We have tried to make the house as toddler-friendly as possible; we cannot fence the pool and children should always be supervised, but we have made life a bit easier by building a low fence around the terrace. Stair gates, baby alarms and cupboard locks are available, plus a playhouse and swing. I am a London Blue Badge tour guide, but have spent most of my career as a driver-guide, taking Americans all over Europe, but specialising particularly in France and Italy. Casa Giulia was originally purchased as a holiday/rental home, in 2003. In the summer of 2004, however, I had a Damascene moment on my return to London. It was a hot sweaty August day and as I was slaving away in the garden, with Reggae music floating across from the neighbours, I began to wonder what on earth I was doing there, when I had a beautiful house in Italy and half my work was in Italy. In October 2005, I moved here permanently and bought another house just down the road from Casa Giulia - it's the best thing I've ever done. My best friend Suzanne used to tease me by saying that we would end up retiring to 'stone cottages' side by side. My cry was 'I don't want to live next door to you'. In 2002, however, I arranged her daughter's wedding in Tuscany and at some point, Suzanne said 'we could get the stone cottages in Italy'. This seemed a much better idea. I had read an article about Le Marche and in November 2002, went to take a look - I was blown away by what I saw and came back with Casa Giulia. I couldn't afford to buy it without selling up in London, so asked Suzanne if she would like to go halves. We exchanged on Christmas Eve 2002, by fax, Suzanne having seen nothing but a photograph! As our principle aim was to have a holiday home that we could use, we equipped it as such, rather than the minimal requirements of a rental only property and it is something that most of our guests comment on. As Suzanne's grandchildren started coming along, we also made it as toddler friendly as possible, which has made Casa Giulia very popular with young families. The views from most houses in this area are pretty spectacular, but when a friend commented that we have the best views of any rental property in the area, I could not disagree, indeed, though beautiful, my own house comes nowhere near! Ground floor: Bathroom with huge shower,WC,bidet and basin plus washing machine. Main bathroom: Bath, separate shower, WC, Bidet and basin En-suite to bedroom 3, shower, WC, basin. Sitting room with typical Marchesian open fireplace, 2 sofas (one a double sofabed), doors to pergola and front garden. TV, video/DVD, Mini hifi system, books, games. Ipod docking station. Kitchen/diner with cooker, hob, 'fridge/freezer, microwave, dishwasher, ironing facilities and dining table for 6, doors opening to pergola. The ski resort of Sassotetto, near Sarnano in the Sibillini Mountains is just 30 minutes away and offers ample skiing for the perfect long weekend. What better way to unwind over a long winter weekend than to spend a few hours on the slopes and come back to a crackling log fire? Notes on accommodation: The pool is unfenced and children must be supervised at all times, but we have made life much easier for parents of young children. In addition to the facilities mentioned above, we have plug-guards, bath toys, mats, steps, potties, indeed everything parents of toddlers could wish for! Outside: Fabulous Mediterranean garden to the front of the house. To the rear, 10x5m pool with lighting and wonderful views. Tiled surround with sun-loungers and umbrellas and surrounded by lawn with a lavender walk. Very large pergola to the side of the house, overlooking the pool with seating for 8 and a portable barbecue. Toddler swing and play house. Utility Room: Washing machine in ground floor bathroom. Cleaning / Towels / Linen / Maid service: Towels (including pool towels) and linen,included and changed once weekly plus cleaning. Extra maid service can be provided for an additional charge, payable locally. Really lovely holiday in this super property. 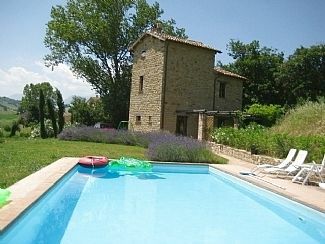 Lovely villa, comfortable, clean and very well appointed, peaceful with super views over countryside. Well located with small towns for local produce and many very good restaurants a short drive away. We really appreciated the good size pool for swimming, the quality sun loungers and eating lunch under the pergola. The night sky was so clear we could see the milky way and a meteor shower overhead. Thank you. Thank you so much, your comments are much appreciated, as was the clean and tidy state you left the house. fantastic too. We also really appreciated your flexibility over non-Saturday arrivals. I couldn't believe how ludicrously beautiful the landscape was either. I have been to places like Urbino in the past but I had no idea just how lovely the southern Marche are. Why the region is not better known and celebrated is beyond me. So pleased you enjoyed everything. We look forward to welcoming you back next year. The house is perfect, usefull, quiet and colse to many beautifull village. a very good location to discover Marche. Carole is a very kind welcoming person. She gave us many good advices and services. thanks Carole! Thank you so much, you were great and charming guests too! Following a very successful cookery course, a couple of years ago, we intend to offer another one in October 2016. This will be for a minimum of 4 people with a maximum of 8 and will be based at Tre Querce, a nearby agritourismo. In addition to hands-on cookery classes, there will be local sightseeing, olive picking and truffle hunting, and a visit to a local chestnut festival. A cookery demonstration at one of the region's best restaurants, followed by lunch, will be one of the highlights. As numbers are small, this should have particular appeal for a group of friends. Email for further details. Casa Giulia is just 35kms from miles of sandy beaches on the Adriatic coast. As always in Italy, every beach has a children's' play area. Ancona airport is just 1 hour 15 minutes away and Ryanair has daily flights. They also have flights to Pescara (2 hours)and Perugia 1 hour 35 minutes. Rome and Bologna are about 3 hours. Journey from the Channel ports is about a day and a half. A car is essential. The nearest village is about 3km away and has all facilities, bank, butcher, baker, restaurant etc. For serious sightseers, the area abounds in Medieval hill towns and there are extensive Roman ruins at Falerone and Urbis Salvia. Loreto is a famous pilgrammage shrine with major works of art as has capital Urbino. Assisi is just 1 hour 40 minutes away. Macerata (40 mins) hosts a major opera festival every July. With the Sibillini National Park just 30 mins away, nature lovers and bird watchers are in for a real treat. Likewise there are numerous walks and mountain-bike rides right around the house. Foodies will be in paradise as the area is reknowned for its truffles. Otherwise, Marchegiani cuisine consists of the freshest of ingredients, simply cooked; on the coast, fish straight from the sea, inland, marinated meats grilled over an open fire. Prices are low and portions are huge! The house contains a full description of the best local restaurants. Booking Notes: Booking is via our booking form which can be downloaded from our website. Changeover Day: We like to be flexible on changeover days to allow people to take advantage of cheap flights. In July and August changeover is normally on Saturdays but again we will try to be flexible.